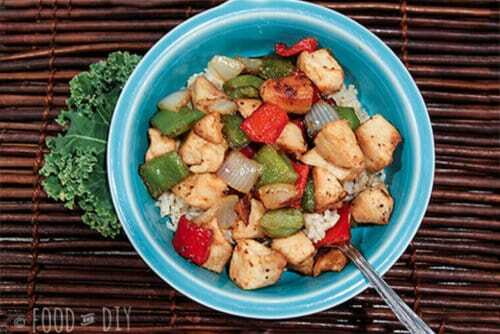 Ginger Chicken Stir Fry An EASY *almost* one dish dinner! 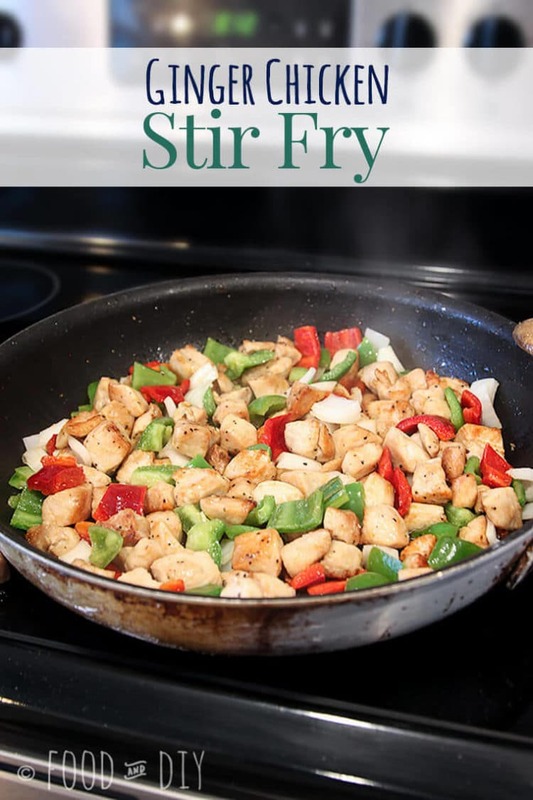 This Ginger Chicken Stir Fry is so delicious and ready in less than 30 minutes! It almost qualifies as a “one dish wonder“…. you only need to make a batch of rice to go along with it. Rice should be pretty easy to cook right? Well, maybe for you normal folks the answer would be a resounding “yes!”. However, I apparently cannot cook rice to save my life. Or I guess I should say I couldn’t. Over the past few months I’ve managed to cook rice properly. Before that my rice was always “not done” and “crunchy” even after following package directions to a T! Clean eating? What is that? Well, it’s something I’ve been trying out and so far I like. ANYway, let’s get down to the recipe, shall we? First, you need to start your rice. I used standard white rice so it takes it awhile to cook. I get that started and then start on the chicken. Heat a large frypan (mine is a whopping 14″) to medium-high heat. Drizzle your cooking oil of choice. I never measure the oil for this part. Take a look at my pan below and keep in mind it’s a large pan. I always use olive oil, coconut oil (mostly for breakfasts) or avocado oil. A word about avocado oil….it turns your meat this weird yellow/green color. Yeah, I didn’t know this. The meat tastes just fine but the color is not great for photographing food for your food site. 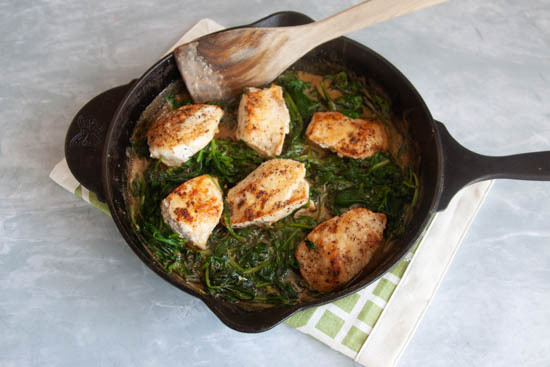 While your pan and oil are heating, cube 3 chicken breasts. I always use boneless, skinless chicken. I greatly dislike touching raw chicken and I sure am not going to de-bone or de-skin one. Call me chicken. HA! Toss all the chicken cubes in a large bowl. My bowl is one of The Pioneer Woman set. These bowls are awesome, they have lids! Season chicken cubes generously with salt & pepper and 1 tsp of ground ginger. Now, add the chicken cubes to the hot frypan. Toss the chicken around every few minutes. You want the cubes to get nice and brown on all sides. 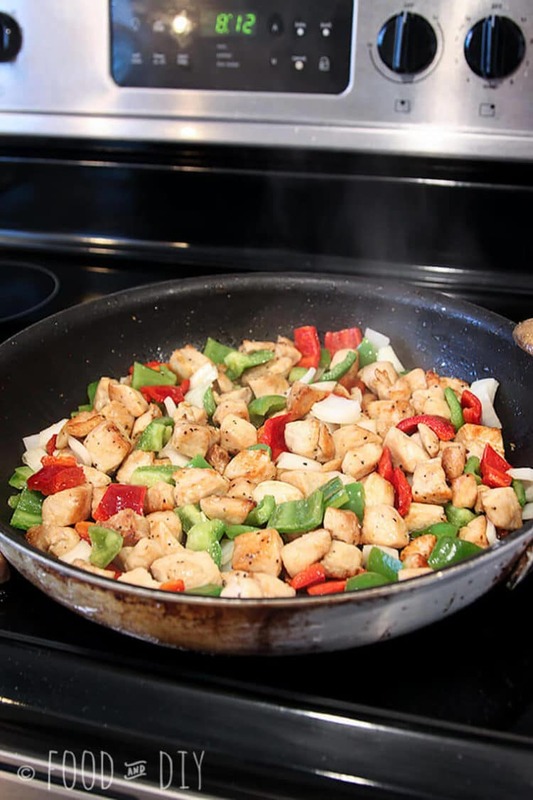 Once your chicken is starting to brown go ahead and add some peppers and onions. While the veggies are cooking the chicken will be getting even browner. If the chicken is too brown when you add the veggies you will end up with overcooked dry chicken. You can use whatever color peppers you like, I usually purchase a variety depending on what’s on sale. I had 2 green and 1 red at the time. Chop, chop. I used the shears that come with the Pioneer Woman knife block. Also, these knives are awesome. Maybe it’s just because my old ones were so very dull. Ok, your chicken and veggies are done and so is the rice. Doesn’t this look amazing?!?!?! I was too busy eating so I forgot about shooting a photo of the soy sauce (or if your clean eating use coco aminos). Soy sauce is so salty so use sparingly! But it does add a nice flavor to the chicken and rice. Enjoy! 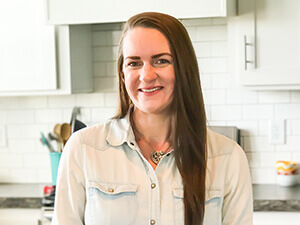 What is your favorite go-to quick meal for busy nights? Tell me in the comments below ↓. This Ginger Chicken Stir Fry is so delicious and ready in less than 30 minutes! It almost qualifies as a "one dish wonder".... you only need to make a batch of rice to go along with it. Heat a large frypan on medium/high heat. Drizzle with olive oil. I never measure oil for this part. 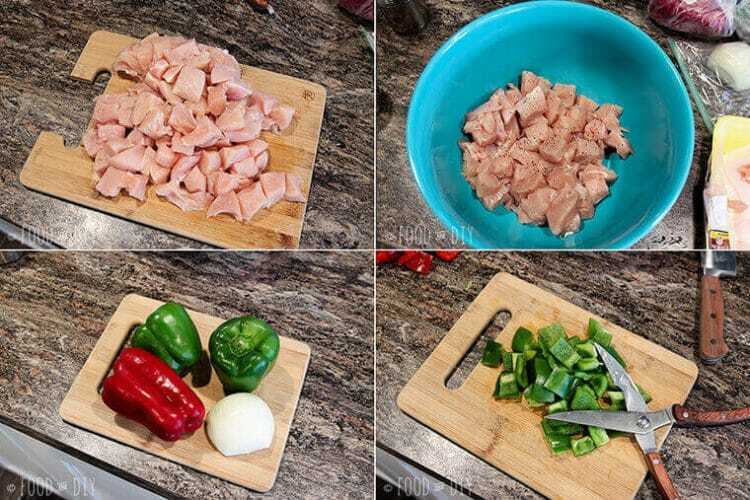 Cut the chicken into cubes. Mine are about 1 inch cubes. Put the chicken cubes into a large bowl, sprinkle generously with salt & pepper. Add ground ginger. Toss until chicken is coated well, set aside. Chop the peppers and onion into 1 inch pieces, set aside. Add the chicken to the hot frypan. 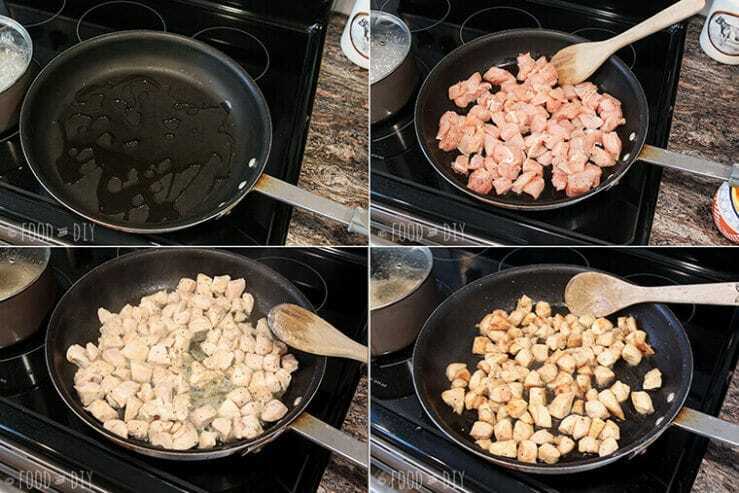 Turn often so the chicken will brown evenly on all sides. Just before the chicken is done and nicely browned, add the peppers and onions. While the veggies are cooking the chicken will finish browning. You don't want overcooked dry chicken! Serve on prepared rice of your choice. Top with a bit of soy sauce or coco aminos. Yummy! Definitely pinned this to try out later! Stir fried cole slaw mix (just cabbage or cabbage/carrots) or riced cauliflower are great substitutes for rice if you want something less carby. Sometimes I use both of them. I like adding coconut aminos and ginger juice.